It's my day off today and I'm playing catch up on a few blog and non-blog related things. I've been super sick for the past couple of days, so I wasn't able to post much both here and on our social media sites. Hopefully, now that I'm slowly (but surely) getting better, I'll be able to post more. Anyways, this week I tried out the Choosy Lip mask in Black Pearl and man do I wish I tried this sooner. With all the average lip masks I tried in the past couple of weeks, this was a refreshing change. It really brings me back to the first 2 Choosy lip masks I tried and I'm super pleased with it. Let's get to know this Pure Smile Choosy Lip Pack in Black Pearl! 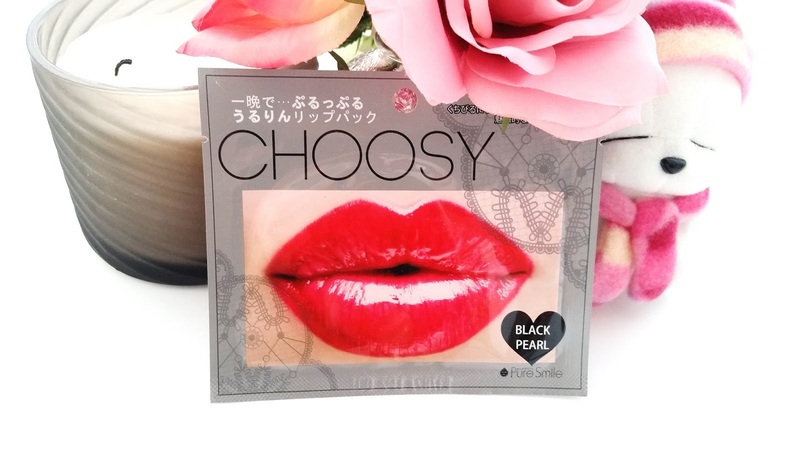 Product Description: The Pure Smile Choosy Lip Pack in Black Pearl is a hydro gel mask made specifically for the lips. The lip mask contains 9 main ingredients to help moisturize, soften, and smooth the lips. 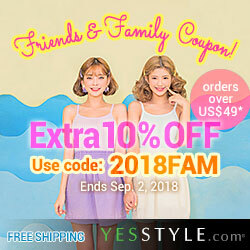 These ingredients are royal jelly extract, hydrolyzed collagen, sodium hyaluronate, bambusa textilis stem extract, grapefruit seed extract, argania spinosa kernel oil, adansonia digitata seed oil, pearl powder, and grape ferment. The mask is easy to use and promises great results to combat dry and chapped lips. To Use: Cleanse your lips and hands first. Remove the lip mask from its packaging and apply it onto your lips. Leave the mask on for 5 to 30 minutes (longer if needed). Remove the mask after and finish off with a lip balm or lip treatment of your choice. Tip: It's more effective to use this lip mask after a bath/shower or lip scrub. Ingredients: Water, glycerin, butylene glycol, ceratonia sillqua gum, xanthan gum, gevuina avellana seed oil, acidophilus/grape ferment, royal jelly extract, honey extract, niacinamide, calcium pantothenate, sodium ascorbly phosphate, tocopheryl acetate, pyridoxine HCI, malt dextrin, silica, sodium starch octenylsuccinate, hydrolyzed collagen, beta-glucan, sodium hyaluronate, chondrus crispus (carrageenan), adansonia digitata seed oil, argania spinosa kernel oil, citrus grandis (grapefruit) seed extract, bambusa textillis stem extract, pinus palustris leaf extract, allantoin, ricinus communis seed oil, calcium lactate, polyglutamic acid, pearl powder, PEG-60 hydrogenated caster oil, fragrance, disodium EDTA, mica, titanium dioxide, iron oxides (Cl 77499), titanium dioxide. As always, I've highlighted the differences between each Pearl lip mask. Interestingly enough, this is the first pearl mask to contain pearl powder. The Pink Pearl mask contains quartz powder while the Purple Pearl mask doesn't contain any gem powders but does contain a wide variety of floral extracts as well as wine extract. 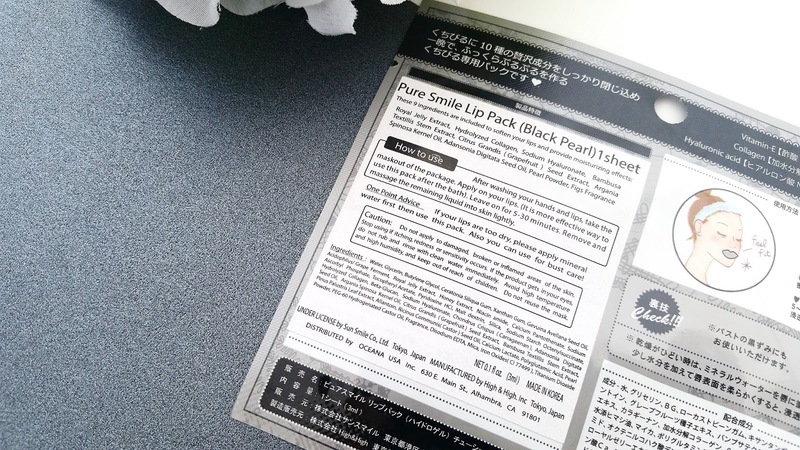 Packaging: The general packaging for all Pure Smile Choosy Lip Packs are pretty much the same with the main differences being the color of the packaging and the information about the product. However, with Pearl lip masks there's another difference and that's the lip design on the front. As you can see from the Purple Pearl and Pink Pearl masks, the lip designs are unique and different. When you open the packaging you'll find the lip mask being protected by plastic coverings like all of its sister products. Scent: The lip mask claims to have included fig fragrances but I was unable to pick up any of that. Although, I am still sick, so my sense of smell is not as great. Anyways, I did pick up a little of what seems to be grape scent, which I contributed it to the grape ferment this mask contains. Aside from that the Black Pearl lip mask also contains that typical Choosy hydro gel scent (I don't think any Choosy lip mask can escape from this scent). 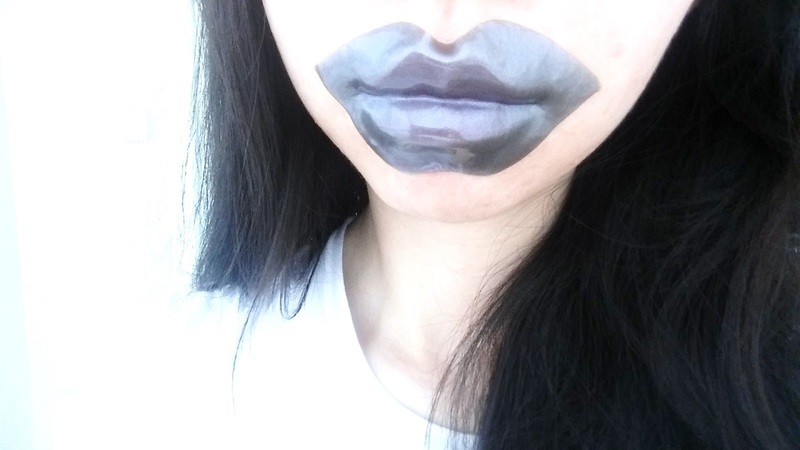 Color: As you can see in the picture above, the Black Pearl lip mask is well black in color. It is opaque, so it looks a bit gray as well. It also contains pearl powder which explains the sparkle like specks in the lip mask. Texture: The hydro gel lip mask has a light and flexible texture. It's easy to apply and stays in place nicely. All Choosy lip masks have the same texture which is just like a typical hydro gel mask but without any mesh to hold its shape. Here's what the lip mask looks like applied on my lips. Michelle's Thoughts: After a couple of weeks of mediocre lip masks I was more than happy to try one that works a whole lot better. I did patch test this lip mask a little because, well, after all the previous misadventures it's better safe than sorry. There was no negative effects from the patch tests, so I applied the lip mask and went about my business as usual. I did remember to take a lip mask selfie this time (proud of me? Lol. I know I tend to forget). The suggested duration of use for the lip mask is between 5 to 30 minutes, but you guys know me I've never really followed that guideline. Instead, I found what works best for me is about an hour and sometimes longer (depending on how fast/slow the lip mask dries). The one hour plus time helps to add a little plumping effect to my lips while moisturizing and softening it. It kind of just enhances all the skincare effects the lip mask already provides, which is great. If you want to get the best results out of using a lip mask, it's always best to have a lip care routine to help before and after the lip mask. For me, a lip scrub before the lip mask and a lip treatment/lip balm afterwards has been the best combination to enhance the lip mask's effects. I was especially pleased with the results I got from the Black Pearl mask. My lips were pretty dry and border-lining chapped before my routine. Since I was sick, I kind of neglected my lips (like 'forgetting' to apply lip balm/treatment) and that was the result of it. My lip scrub managed to remove quite a bit of dead skin and prepared my lips for the lip mask. Once applied, I left the lip mask on for roughly 1 hour and 15 minutes. I kind of just went about my business and removed the lip mask when it starts to feel almost dry. The results were amazing. My lips felt moisturized and were soft to the touch. It was pretty smooth as well and plump, which was what I was aiming for. I applied lip balm after to help seal in the deal. It's been 3 days since and my lips are still soft and moisturized and the only products I've used since to help elongate the effects are my lip balms (during the day) and lip treatment (at night). Final Thoughts: After all those unlucky weeks with meh lip masks, I'm glad this week's lip mask was a lot better. It's totally landed in my love list and no doubt I will repurchase. This Black Pearl lip masks offers all the lip care benefits I look for in a lip mask and then some. I am super pleased with it. 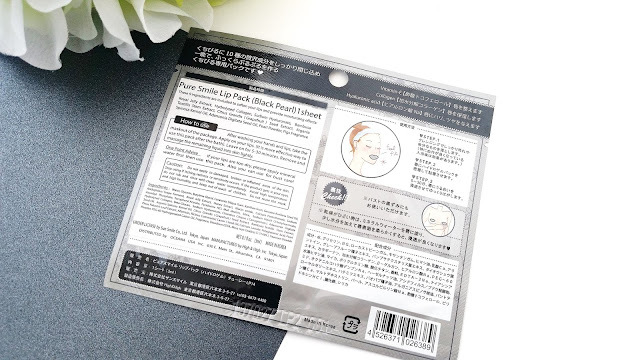 Would I repurchase this lip mask in the future? Yes! Finding a fantastic lip mask isn't easy, so once I find one I'll make sure to restock on it. Do I think this is worth a try? Yup! I was really happy with the lip care benefits this lip mask provided and I do believe it's worth a try for anyone looking for a great lip mask. There are also a ton of other Choosy lip masks to choose from as well in case you are looking for another 'flavor'. Pure Smile Choosy has 3 lines of lip masks, the Original (which includes Peach, Milk, Fruit, Herb, and Honey), the Pearl (which includes Pink, Purple, Black, Gold, and White), and the Art line (which includes lip masks with unique designs.